The Metro Breez commuter bus made its first stops in Brunswick Thursday morning, and is offering free rides to promote the expansion. 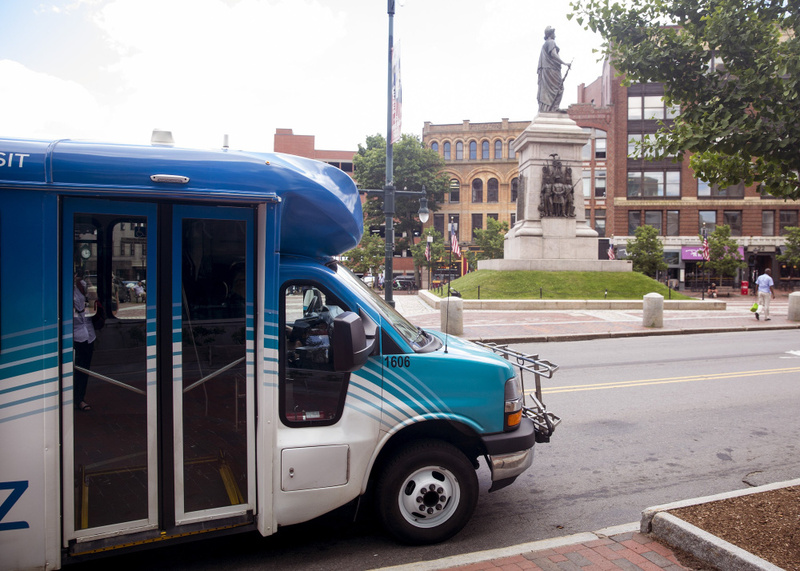 Portland and Brunswick are now connected by a regional commuter bus, and the service is free through Saturday. The first Metro Breez bus arrived Thursday morning at the Brunswick Train Station, one of three new stops in the city. Breez buses make three stops in Freeport, three more in Yarmouth and five stops in Portland. The trip from Monument Square in Portland to the Brunswick Train Station takes about 45 minutes. The launch of service to Brunswick was celebrated Thursday by community leaders, Metro officials and Maine Transportation Commissioner David Bernhardt. The service includes 14 trips a day Monday through Friday between 6 a.m. and 9:05 p.m., and six trips on Saturday. The regular one-way fare will be $3, although rides will be free through Saturday to promote the newly expanded service. The three-year pilot Breez service, funded with federal grants and matching funds from Freeport and Yarmouth, was launched last year to Yarmouth and Freeport. It was extended to Brunswick thanks to additional grant funding and an agreement between Brunswick Town Council and Metro. The town is projected to pay roughly $76,000 over the next two years for the service. Bowdoin College also contributed an annual $10,000 for the service. Metro recently canceled underperforming stops at the Falmouth Shopping Center and a Yarmouth park-and-ride, but officials said Thursday that ridership is increasing overall. For more information on the route, visit gpmetrobus.com.